In the Multiverse Crossover Pack included with DC Deck-Building Game Multiverse Box, players battle to get past their rivals’ Champions. Each player receives an oversized Multiverse Location card (from the pack), an oversized DC Super Hero/Super-Villain card (from the collection of DC Deck-Building Game cards players have placed in their box) and three DC Super Hero/Super-Villain cards (from the collection in their box) that are his or her Champions. To set up the game, players select a main deck from any of the four current DC Deck-Building Game base sets, shuffle in the 19 new main deck cards, and lay out the standard five-card Line-Up. The Multiverse Crossover Pack expands gameplay by adding a second Line-Up of five cards, allowing players to build up their decks more easily than ever before. Built using a card set determined by the Randomizer deck, this new Event Line-Up does not refill like the main deck Line-Up does. Instead, when the last card in the Event Line-Up has been removed, a new Event card is flipped face up, creating a new five-card Line-Up from a different random set. The old Event goes away, and a new Ongoing effect is active while these new five cards are around. There are three new DC Super-Villains in the Multiverse pack: Brainiac, Telos, and Deimos. A player can end the game by being the last man standing (he or she wins!) or by defeating Deimos (highest Victory Point total wins). Note that there is no player elimination in this game. 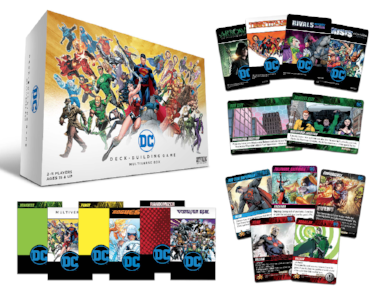 The DC Deck-Building Game Multiverse Box is available now at retailers nationwide for a suggested retail price of $25. Are you a table top gamer? Let us know in the comment section below. Also, don’t forget to Like, Share & Subscribe to all things Constant Collectible to keep up to date with all the news and reviews from a world of Geek Culture.